I've blogged before about the cats killing bats and leaving them on the doorstep. But recently I let Bobby in the house and Paul said, "He's got something!" Bobby dropped it on the rug and sure enough, it was a bat. I had to put Bobby outside while Paul grabbed the first thing he could find - a kid rake. He put it over the bat so that it couldn't fly off in the house. Luckily, it seemed stunned. So Paul turned the rake over and I tried to gently nudge the stunned bat onto the rake. Which is when the bat spread it's wings, made a hissing sound, and bared it's fangs at me! Whoa! This bat was very angry. Meanwhile, Bobby was outside clawing the door and trying to get back in the house to his bat. He was angry too! 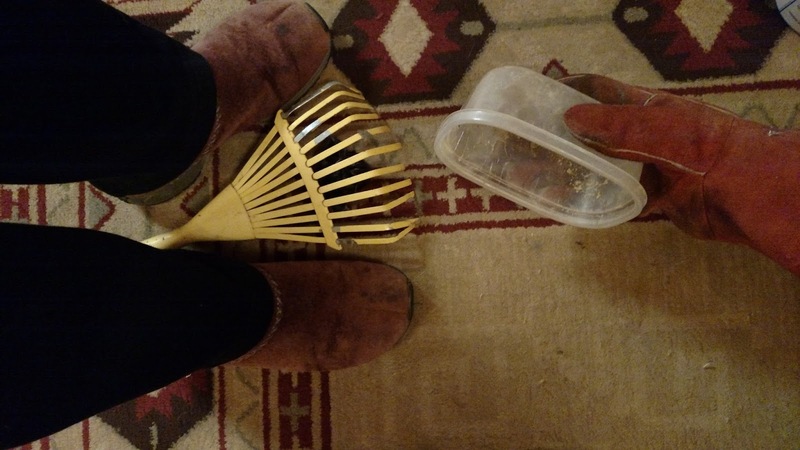 So the rake went back over the bat and I blocked the sides with my shoes in case the bat tried to escape while Paul ran to the basement for supplies. He came back with a small Tupperware container, some huge welding gloves, and cardboard. Thankfully, we were able to place the container over the bat, put cardboard underneath, and relocate the bat to the outdoors where it belonged. Then I disinfected the rug with Clorox wipes. People talk about living the quiet country life. But some days? Some days there is never a dull moment. goodness thats quite an adventure in itself. When I had a pet door and allowed cats in I was treated to a number of critters in the middle of the night.One with teeth would be tough. Strange that they would name an animal after the tool to hit it with. Probably had disease along with fleas, nasty little things. ...never a dull moment in your house! Geepers...I would have put on combat boots. Paul's gloves were good though! I do not like bats...they are the creepiest things. Well, next to snakes, of course. I'm glad it all turned out ok. I know bats do a lot of good for the environment, but I'm afraid of them. I think of rabies. I have similar visitors. Usually they come swooping around the living room. I wait til they land on the log wall, then catch them in a dish cloth and let them go outside. A few nights ago, I woke up to a hissing noise coming from the room over my head.Went up the stairs, and two of the cats had knocked down a big bat in the study. I got the towel out of the bathroom up there, got the bat in it, and let him go outside. I felt bad for him because it was really cold outside, but I figure he must have had a place to go. The cats were really annoyed. Wow! This is the weirdest Christmas story EVER! I LOVE it! Too bad you couldn't get shots of the mad bat. You guys seem prepared for anything. I am so glad it ended alright, they say lots of bats carry rabies. The picture was so strange, I couldn't wait to read what in the heck was going on!! I bet the boys were sad they missed it. This gives me shivers! We used to get bats in our house all summer long,and I despise them. Their little squeaks as you try to capture them in a container (the same way you did it!!) are just ugh. And their "sticky" feet. Ok, enough from me about bats. Having our roof repaired and unused chimneys capped helped a lot! I hope your cat forgave you! Long ago when I was very pregnant I sat on the toilet, looked down and there between my FEET was a bat.. staring up at me, hissing. HOW DID I MISS THAT Before sitting down? I have no answer. Golly! sounds like a movie scene . . how exciting for everyone. I did not know they could hiss. That would freak me out! My sister got a bat in her house at night once. My brother-in-law was at work (fireman). She freaked out, and ran outside with the phone to call for help. While she was outside, my niece got up out of bed. She came in the kitchen, saw the bat fluttering on the floor, and started screaming. It was quite the event! Oh my goodness, very scary indeed! My grandmother lived in a neighborhood that had lots of bats and she would get them in her attic! That was really scary when I was little. We had an interesting thing in our house this week, a squirrel! At first I couldn't understand why my two dogs and our kitty cat were going bonkers chasing up and down the stairs barking like crazy until oops I caught sight of it running scared from the bathroom to one of the bedrooms. Thankfully no damage and the squirrel lived and ran out the door! Man it was a wild few minutes though! It hissed at you?! Good grief! Glad you were able to get it out of the house. That's the thing about living in the country, always wild things around! Glad you were able to save the poor thing! Oh my! Good job in catching it. We had one once in the cabin we rented each year in Mammoth Lakes, CA. Thankfully Mark took care of it. i appreciate that you saved the bat [though i am afraid of them]but it can not be the reason to hurt them. it is nice that all went fine yet it seems like a thrilling story . I am terrified of bats! My brave husband would have been dealing with the bat, while I was hiding out somewhere else in the house!! oh that's kind of a scary adventure! glad it didn't take off flying around the house!! Oh no no I would completely freak! And that's the truth, whole truth so help me. Glad Paul was there! Oh please... I remember that my cat went home with a snake, and put it infront of our bedroom. It was really annoying. Ugh! I actually love bats. But, not ones that are ready for battle. Cats do the darnedest things. hahaha....nah it's never dull in the country. I heard that if cat loves you, it would present you with their catch. Sometimes can be gruesome. My cat had once caught a roach in his mouth. Yucks. Yikes! I've never seen bat fangs other than in the movies. So glad you had the supplies needed to help this bat make a "peaceful" exit. What excitement!